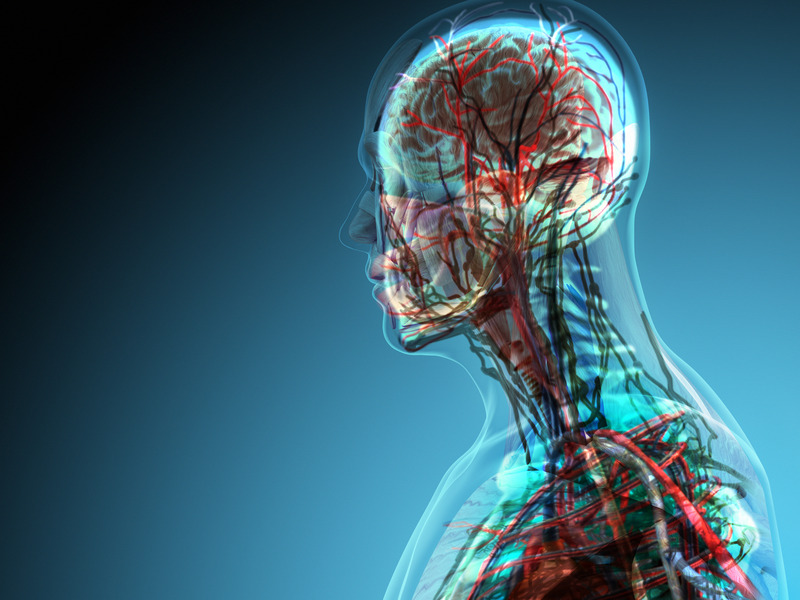 Researchers have identified a network of fluid-filled spaces surrounded by connective tissue that fills the spaces between our organs, surrounding and potentially protecting our insides throughout the body. In a study, scientists define this network as a new organ, the interstitium, which they say could be the largest organ in the human body. Understanding this network as an organ could help us understand how diseases like cancer spread and it help explain what healing techniques like acupuncture are tapping into. It might seem like we should already have identified all the structures in the human body, even if we don’t know the function of every cell and organ. But that assumption might be very wrong, if the authors of a study newly published in the Nature journal Scientific Reports are correct. In between the spaces in our bodies – beneath the skin, lining the gut and lungs, surrounding blood vessels and fascia between muscles, and more – there’s a fluid-filled network of tissue. The idea that there’s tissue and fluid in these spaces isn’t new; interstitial fluid is one of the significant types of fluid in the body, though we didn’t know it was contained in these structures. But the authors of the new study say this tissue has a unified structure and function throughout the body that makes it an organ. Using that definition, it could be the largest organ in the body, taking up a bigger volume than even our skin. This organ might help protect the rest of our organs and tissue. It could also explain the spread of certain cancers, as well as how a number of diseases progress in the body. 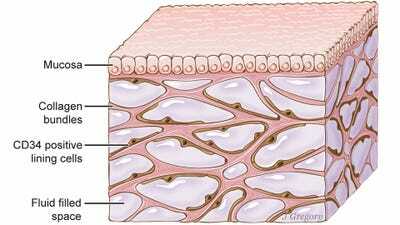 Illustration by Jill GregoryA newfound organ, the interstitium, is seen here beneath the top layer of skin, but is also in tissue layers lining the gut, lungs, and urinary systems, as well as those surrounding blood vessels and the fascia between muscles. The organ is a body-wide network of interconnected, fluid-filled compartments supported by a meshwork of strong, flexible proteins. Researchers previously thought the area between other organs and tissues in our body was largely solid, comprised of structural supportive proteins known as collagen, as well as stretchier elastin connective proteins. But an analysis using a newer kind of imaging technology (called probe-based confocal laser endomicrosopy) revealed that interconnected fluid-filled sacs run through the collagen and elastin structures. Past attempts to look at this tissue under a microscope made it impossible to see these connected fluid-filled spaces and overall structure. Slicing it up caused the fluid to drain, emptying the sacs and causing them to collapse, and just leaving the supporting proteins behind. Looking at things in a new way allowed researchers to view the structure of the tissue without causing it to collapse, significantly changing how we understand our insides, Dr. Neil Theise, a professor in the Department of Pathology and co-senior author of the study, explained in a news release. The implications for all this are enormous. 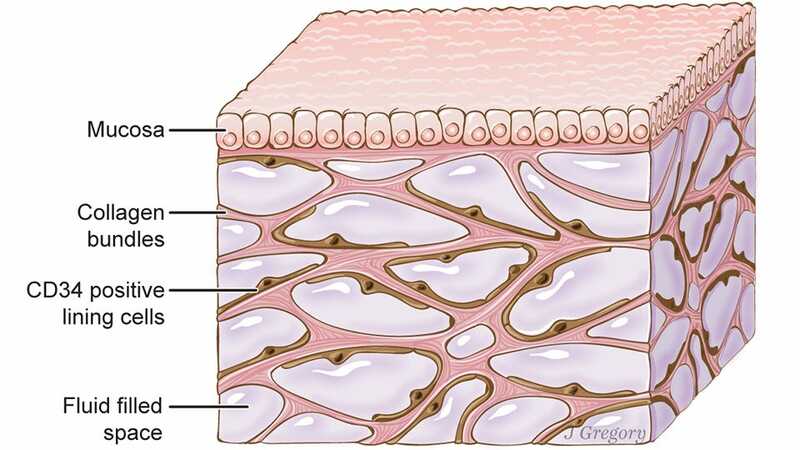 Illustration by Jill GregoryOn the left you see the structures that make up the interstitium viewed in different ways, on the right you see different places doctors have identified this same tissue. It appears that the interstitium might have a unified function or functions. That could help researchers decide if it really is an organ, since organs usually serve at least one specific purpose. There are several ways the network of interstitial fluid and connective tissue could better explain how the human body functions. The fluid-filled sacs throughout this tissue could help interstitial fluid travel throughout the body. That’s important because fluid in this network is the largest source of lymph, which is a critical part of the immune system. “This finding has potential to drive dramatic advances in medicine, including the possibility that the direct sampling of interstitial fluid may become a powerful diagnostic tool,” said Theise. A better understanding of this interstitial network could help us understand why skin wrinkles as we age, why limbs get stiff, and how inflammatory diseases spread. It may also explain why cancers that spread into the space between organs are more likely to show up in other parts of the body. As something that surrounds our blood vessels and organs, the interstitium might help protect them from tearing and may help absorb shocks that could otherwise damage parts of our body. It’s even possible that studying these spaces could help reveal what acupuncture is or isn’t doing within the body. It will take time and research before the medical community at large decides whether or not to treat the interstitium as an organ. But the possibility that this network of fluid and tissue is an entirely new organ reveals that even in parts of ourselves we thought we understood, we still have plenty to learn.